SYTYCD Twitch's Royal Dance Move on DISNEY'S FAIRY TALE WEDDINGS Preview! 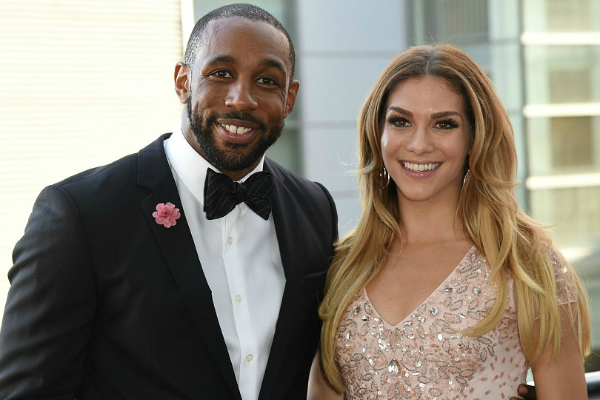 “So You Think You Can Dance” All-Stars Stephen “Twitch” Boss (also on “Ellen” show) and Allison Holker (“Dancing with the Stars” pro) real-life married couple, host “Disney’s Fairy Tale Wedding” which returns to Freeform on June 11 with six new episodes. Freeform will be airing a “Happily Ever After” themed Funday movie marathon (airing MAY 12 – 13) featuring some of your favorite Disney Princesses, followed by Freeform’s first ever “Royal Wedding Slumber Party” on FRIDAY, MAY 18 to get you ready for the most highly anticipated event of the year. The next morning, SATURDAY, MAY 19, Freeform will simulcast a “Good Morning America” extended edition coverage of the royal nuptials of Prince Harry and Meghan Markle starting at 5:00 a.m. EDT/2:00 a.m. PDT. The festivities begin the weekend before the royal extravaganza when Freeform airs a “Funday: Happily Ever After Edition” movie marathon, highlighting beloved Disney Princesses and fairy tale heroines from far and wide who all found their happy endings. An encore of Freeform’s “Disney’s Fairy Tale Weddings” special will also be featured. “Funday: Happily Ever After Edition” airs SATURDAY, MAY 12 through SUNDAY, MAY 13 from 7:00 a.m. EDT/PDT to 7:30 p.m. EDT/PDT. In this modern twist on “Cinderella,” Ella (Anne Hathaway) lives in a magical world in which each child, at the moment of their birth, is given a virtuous “gift” from a fairy godmother (Vivica A. Fox). Ella’s so-called gift, however, is obedience. This birthright proves itself to be quite the curse once Ella finds herself in the hands of several unscrupulous characters whom she quite literally cannot disobey. Determined to gain control of her life and decisions, Ella sets off on a journey to find her fairy godmother who she hopes will lift the curse. The path, however, isn’t easy; Ella must outwit a slew of unpleasant obstacles including ogres, giants, wicked stepsisters, elves and Prince Charmont’s (Hugh Dancy) evil uncle, who wants to take over the crown and rule the kingdom. In this encore airing, the 90-minute special will give viewers a behind-the-scenes look at the one-of-a-kind weddings and magical engagements that take place at Disney Destinations around the globe. Viewers will get a glimpse of the modern day fairy tale, from experiences, fashion and products to world-class entertainment and décor. The Disney’s Fairy Tale Weddings brand has celebrated these moments and happily-ever-afters for more than 25 years. “Disney’s Fairy Tale Weddings” repeats on SUNDAY, MAY 13, at 7:00 a.m. EDT. English voyager Captain John Smith falls in love with Chief Powhatan’s free-spirited daughter Pocahontas while exploring the New World. “Disney’s Pocahontas” repeats on SUNDAY, MAY 13, at 8:35 a.m. EDT. To save her aging father from having to fight in an upcoming battle, a young Chinese maiden disguises herself as a male and joins the Army. “Disney’s Mulan” repeats on SUNDAY, MAY 13, at 10:35 a.m. EDT. A fateful kiss leads a young woman (Anika Noni Rose) and a frog prince (Bruno Campos), who desperately wants to be human again, on an adventure through the bayous of Louisiana. “Disney’s The Princess and the Frog” repeats on Sunday, May 13, at 12:45 p.m. EDT. Merida (Kelly Macdonald) is a skilled archer and headstrong daughter of King Fergus (Billy Connolly) and Queen Elinor (Emma Thompson). Determined to carve her own path in life, Merida defies an age-old custom sacred to the unruly and uproarious lords of the land. When Merida’s actions inadvertently unleash chaos in the kingdom, she must harness all of her skills and resources, including her clever and mischievous triplet brothers, to undo a beastly curse before it’s too late and discover the meaning of true bravery. Acclaimed and treasured like no other, Disney’s beloved modern classic will sweep you off your feet. Be our guest and join the beloved, independent Belle and the Beast with the soul of a prince as they cast an enchanting spell. (Animated.) “Disney’s Beauty and the Beast” repeats on SUNDAY, MAY 13, at 2:55 p.m. EDT. Fearless optimist Anna (Kristen Bell) teams up with rugged mountain man Kristoff (Jonathan Groff) and his loyal reindeer, Sven, in an epic journey, encountering Everest-like conditions, mystical trolls and a hilarious snowman named Olaf (Josh Gad) in a race to find Anna’s sister, Elsa (Idina Menzel), whose icy powers have trapped the kingdom of Arendelle in eternal winter. Can Anna save her sister and bring sunshine back to their home? Or will Arendelle be frozen forever? (Animated) “Disney’s Frozen” repeats on SUNDAY, MAY 13, at 5:00 p.m. EDT. Edvard, the Crown Prince of Demark, shirks his royal duties to attend college in Wisconsin. There, he pursues med student Paige (Julia Stiles), while keeping his true identity a secret. On Friday, May 18, the evening before the royal wedding, beginning at 7:45 p.m. EDT/PDT, viewers are cordially invited to Freeform’s “Royal Slumber Party,” featuring wedding-themed movies that will air throughout the night in anticipation of the regal bridal fete. Freeform viewers can tweet along with @FreeformTV during the movies. An old man (James Garner) in a nursing home begins reading a story to a female fellow patient (Gena Rowlands) to keep her company. The story is about a young couple (Ryan Gosling and Rachel McAdams) who share a stormy romance over a period of years. Mary Fiore (Jennifer Lopez) is San Francisco’s most successful supplier of romance and glamor. She knows all the tricks. She knows all the rules. But then she breaks the most important rule of all: she falls in love with the groom. The morning of Saturday, May 19 at 5:00 a.m. EDT/2:00 A.M. PDT, “Good Morning America’s” live wedding coverage will be simulcast on Freeform. “Good Morning America” co-anchor Robin Roberts and “World News Tonight” anchor David Muir will lead live coverage from Windsor, England. Roberts and Muir will be joined by a team of reporters and royal experts, including “Good Morning America” weekend anchor and “The View” co-host Paula Faris; correspondents Deborah Roberts, James Longman, Adrienne Bankert; contributors Imogen Lloyd Webber, Victoria Murphy, Omid Scobie and British Royal Biographer Andrew Morton, who will bring live reports of the arrivals, ceremony, carriage ride around Windsor and other festivities from various locations throughout Windsor and London. From epic surprise engagements to romantic fairy tale weddings, the upcoming “Disney’s Fairy Tale Weddings” series will showcase a variety of enchanting stories and spectacular settings from Disney destinations around the globe. 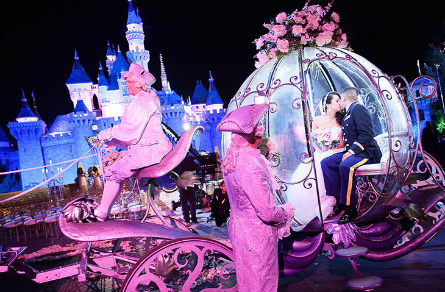 Journey along with these couples as they celebrate their unique love stories with the help of Disney’s Fairy Tale Weddings. Rustic outdoor settings to elaborate castle backdrops, and everything in between, serve as backdrops to this captivating six-episode series premiering MONDAY, JUNE 11 at 8:00 PM EDT/PDT.